Where Does Our Water Come From & Where Does It Go? Groundwater is an important source of water supply for the community of Grand Forks. The area is very arid and groundwater from an underlying aquifer provides water for both domestic, municipal and irrigation uses. The aquifer straddles the Canada/USA border; approximately 95% of the aquifer occurs on the Canadian side, and the remainder on the US side. The Grand Forks aquifer is unconfined sand and gravel and is one of the most important aquifers in British Columbia: the aquifer has been classified by the Ministry of Environment as an “IA”, heavily developed, highly vulnerable to contamination, aquifer. 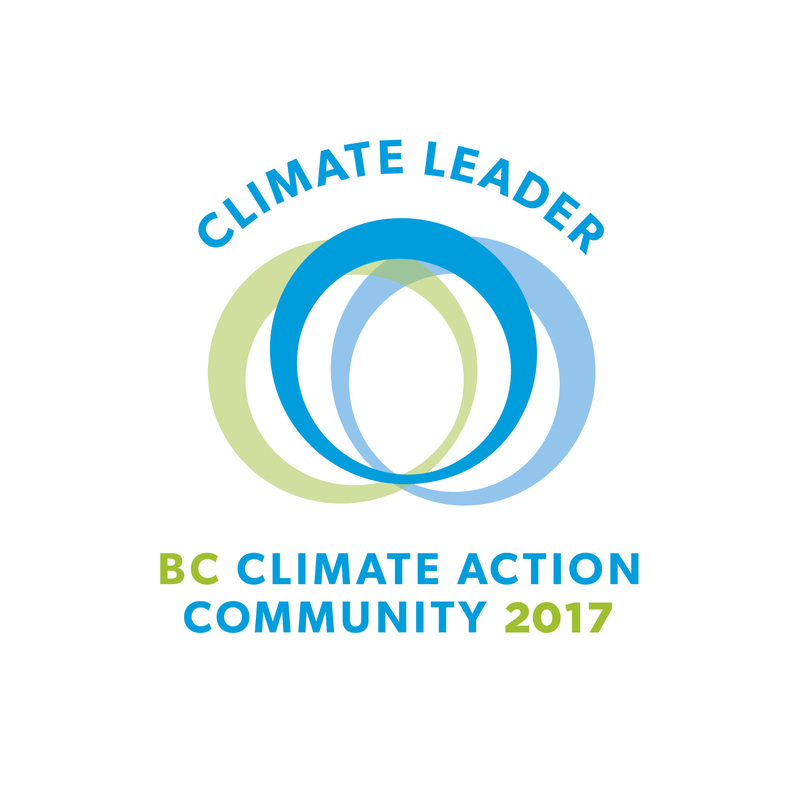 Since the late 1990’s, the Ministry of Environment and Simon Fraser University have jointly focused efforts in characterizing the aquifer to support the local community in addressing potential risks to the groundwater, and also to enable the City to consider groundwater sustainability and protection in land use decision-making and planning. Almost 97.5% of water on earth is saline (salty) The remaining 2.5% of water on earth is freshwater. Of the remaining freshwater, 69% is locked up in glaciers and ice caps and 30% is groundwater. The remaining 1% is composed of surface and other freshwater which is found in ground ice and permafrost (69.0%), lakes (20.9%), soil moisture (3.8%), the atmosphere (3.0%), swamps and marshes (2.6%), rivers (0.49%), and living things (0.26%). This leaves 0.01% available fresh water out of all water on earth. 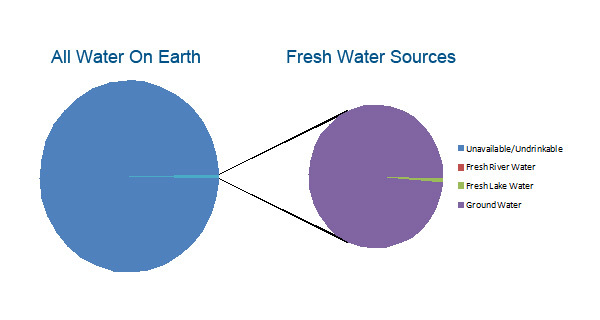 Notice in the pie chart below that Fresh River Water does not even show up? There is more of an interaction between the water in lakes and rivers and groundwater than most people think. Some, and often a great deal, of the water flowing in rivers comes from seepage of groundwater into the streambed. 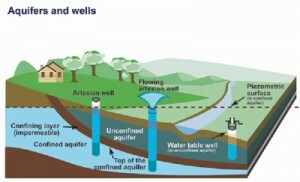 Groundwater pumping can alter how water moves between an aquifer and a stream, lake, or wetland by either intercepting groundwater flow that discharges into the surface-water body under natural conditions, or by increasing the rate of water movement from the surface-water body into an aquifer. A related effect of groundwater pumping is the lowering of groundwater levels below the depth that streamside or wetland vegetation needs to survive. The overall effect is loss of riparian vegetation and wildlife habitat. Where Does the Water in Rivers Go? Like everything else on (and in) the Earth, water obeys the rules of gravity and tries to get to the centre of the Earth. So, the water in rivers flows downhill, with the ultimate goal of flowing into the oceans, which are at sea level. River water may end up in a lake or reservoir, in an irrigation pipe , in a local swimming pool, or in your drinking glass, but much of it eventually ends up back in the oceans, where it rejoins the water cycle, which is always in progress. One river that doesn’t participate anymore in this normal cycle is the mighty Colorado River, flowing from Colorado to the Gulf of California in Mexico. The Colorado River certainly starts out mighty – mighty enough to have carved out the Grand Canyon – but nowadays it does not even end as a trickle. Whereas it once flowed into a large marsh, today it literally disappears in the farmland in Mexico. As the Colorado River flows through the desert, it gets used and used by millions of thirsty residents and for crop irrigation; used until there is nothing left. 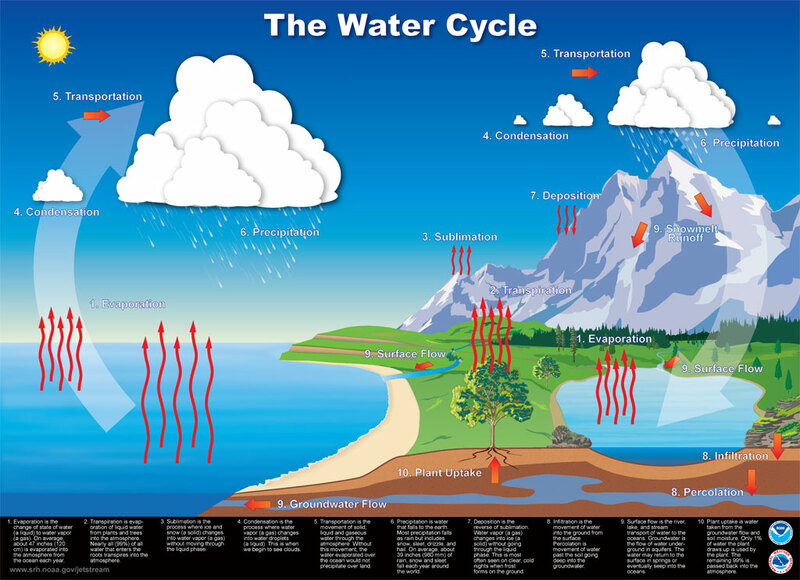 Earth’s water is always in movement, and the natural water cycle, also known as the hydrological cycle, describes the continuous movement of water on, above, and below the surface of the Earth. Water is always changing states between liquid, vapour, and ice, with these processes happening in the blink of an eye and over millions of years. Get to know your H2O! 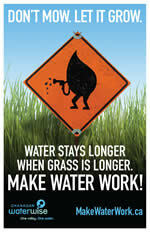 Most of our residential water is used on lawns and gardens. Unfortunately, much of this water evaporates before it can benefit grass and plants. When we water in the hot sun, as much as half of the water is lost to evaporation. Just the simple act of watering in the cool of the evening makes every drop count. 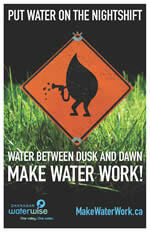 Find simple ways to Make Water Work best on your lawn and garden! Feel free to download and print the posters here and post them in your workplace. Let’s all MAKE WATER WORK! 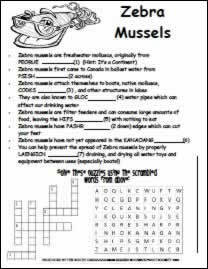 Aquatic Invasive Species are non-native plants and animals introduced to a lake, river, creek, wetland or other water body. Without natural enemies to control their spread, these species out-compete native plants and animals for food and space. They harm water quality and can impact human health. Once they get a foothold in an area, it is often impossible to eradicate them, requiring costly ongoing treatment. 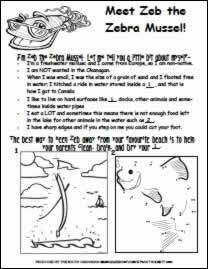 Download Kids Activity Sheets, Rack Cards, and Fact Sheets here. The Slow it. Spread it. Sink it! 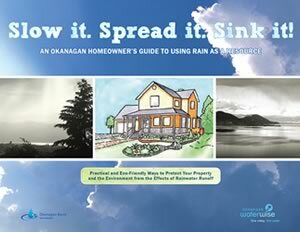 An Okanagan Homeowner’s Guide to Using Rain as a Resource is an easy-to-use guidebook, showing local residents how they can easily capture and re-use the water that falls on their property. There are many reasons for collecting and using rainwater. First, the water that comes out of our taps has been cleaned and treated at great cost to your water provider – and you, the taxpayer. 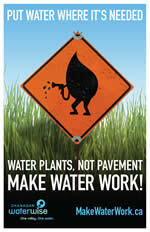 Using treated water on our gardens, and for other non-consumptive purposes, is not money well-spent. As more and more communities adopt the use of water meters, and we start paying for the amount of water we use, saving water will mean saving money. Climate change studies suggest that, in addition to the potential for drought, the Okanagan will also experience periods of extreme rains. Heavy rains can cause damage, washing debris into our storm sewers, affecting water quality, which in turn can affect the fish, the wildlife, and the people who rely on these waters. It makes sense then, to collect the water that falls on our properties. 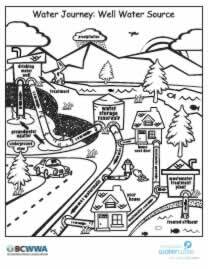 The goal is to: Slow it down instead of speeding it through pipes and into the lakes; Spread it out across the properties instead of funneling it into storm sewers, and; Sink it back into the ground, recharging our groundwater supplies, and naturally filtering it before the water finds its way back into our streams and lakes. Find the Slow it. Spread it. Sink it! (7MB PDF) here. 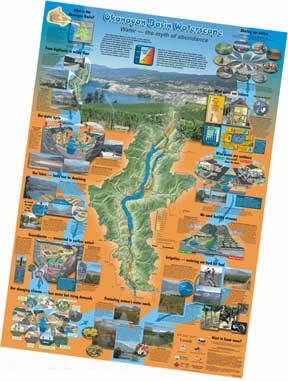 The Okanagan Basin Waterscape Poster was created as a water education tool. 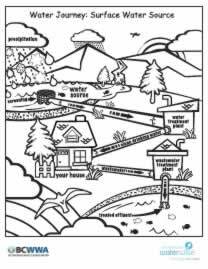 This detailed and colourful poster illustrates topics of major importance to water resources in the Okanagan, including groundwater, domestic water use, and the effects of climate change and population growth. 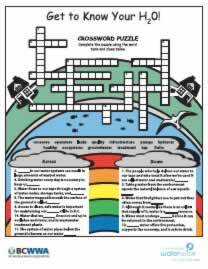 Copies of the poster are available by calling us in Kelowna, B.C. at 250-469-6271. 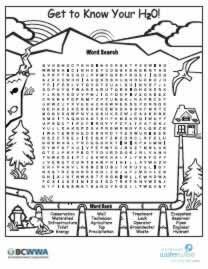 These activity sheets were created by the BC Water & Waste Association – an Okanagan WaterWise partner – as part of BC Drinking Water Week.